In my last post, I described my initial yearning to be with God during my two night hermitage at Pacem in Terris. I wanted to be still and simply rest in my heavenly Father’s presence. The inside of the hermitage encouraged my yearning. 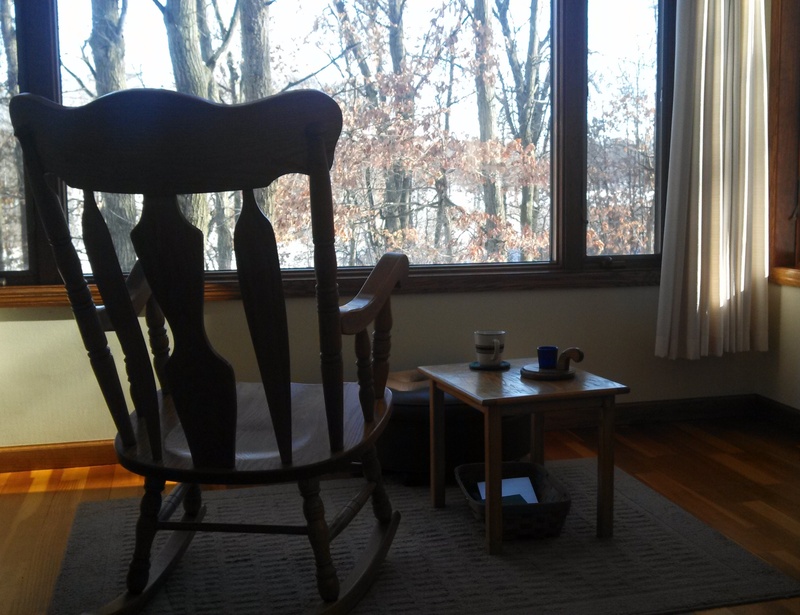 The large rocking chair helped me slowly rock my anxious thoughts away and enter into a time of quiet rest. Windows covered the whole east wall and the view, though not stunning, was calm and serene. The many trees were stripped of leaves and dappled with snow. In the distance I could see portions of a small snow-covered lake. The view invited me to be at peace. I spent time simple rocking, reflecting, and reading scripture. I also was feeling blessed and meditated on a favorite psalm, 103. Bless the Lord, oh my soul, and all that is within me, bless his holy name. I reflected on the down-to-earth satisfaction of being open to God’s Spirit. I prayed for all who seek satisfaction in our world. I prayed for my family, my congregation and the world, that we might be satisfied in God’s gracious love. I went to bed early and slept well. I rose before dawn, observing the slowly brightening sky. I rocked as I watched the sky turn shades of red and magenta as the sun lifted over the horizon. What a simple yet profound joy to watch the sun give light and life to our world. That east window gave me perspective on my life. 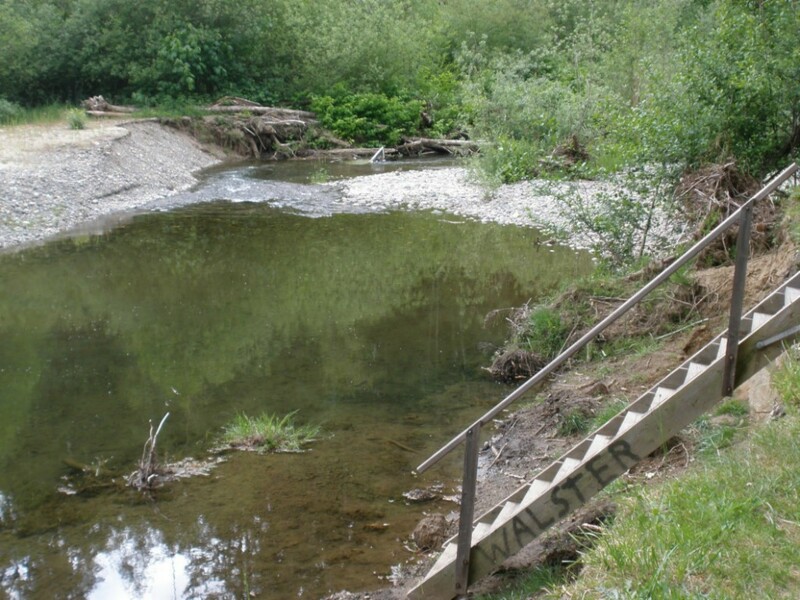 Years ago, my dad bought a small piece of property on the Tahuya River (really more of a creek than a river) in an isolated section of Washington state. Every week-end he would drive the thirty miles to the property where he constructed his own cabin in the woods. I had started seminary at the time; he was about the age I am now. He constructed the cabin without power tools, mixing the cement by hand with water from the river. It was a plain A-frame cabin, with few frills. He spent years building it. I visited the cabin only three to four times during the time he owned it. I never slept in it; my dad rarely did either. One thing it seemed to lack in my memory were any large windows. I remember it as a dark, dreary place – though I also remember how satisfied and content my father was when he visited it. It was his place of rest. We each need places of rest and restoration, though each of us may discover different places that suit our personality. I know that if I should ever build a cabin in the woods it will need windows and lots of them. Where do you find your window on the world? Lord Jesus, open the windows of my heart that I might see you. This entry was posted in Body Mind Spirit, Prayer and tagged cabin, hermitage, Pacem in Terris, peace, Psalm 103, satisfy on February 22, 2014 by Pastor John Keller. A window on the world for me is a condo balcony overlooking ocean beaches of the Gulf of Mexico, especially the sunrises and sunsets. Pastor, thanks for your thoughtful messages.